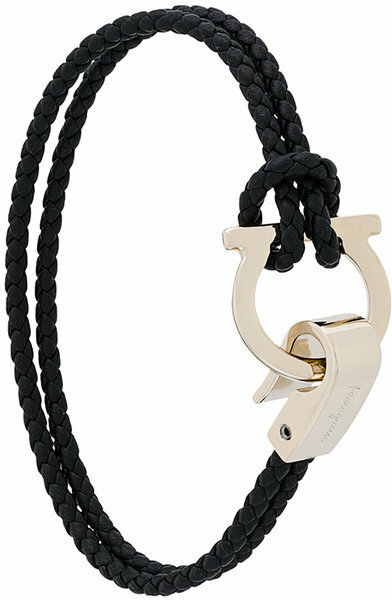 Reach for a black cropped top and a Salvatore Ferragamo braided gancio bracelet for a casual-cool vibe. When it comes to footwear, this getup is finished off nicely with black leather flat sandals. Marry a black lace long sleeve t-shirt with a Salvatore Ferragamo braided gancio bracelet to be both casual and knockout. Opt for a pair of black suede pumps to kick things up to the next level. Opt for a beige fur jacket and a Salvatore Ferragamo braided gancio bracelet, if you feel like relaxed dressing without looking like you don't care. Rocking a pair of black leather ankle boots is a simple way to add extra flair to your ensemble. If you're obsessed with relaxed dressing when it comes to fashion, you'll love this chic pairing of a charcoal tank and a Salvatore Ferragamo braided gancio bracelet. You could perhaps get a little creative when it comes to footwear and dress up your getup with tan suede heeled sandals. If you're obsessed with functionality dressing when it comes to your personal style, you'll love this absolutely chic pairing of a navy cardigan and a Salvatore Ferragamo braided gancio bracelet. When it comes to footwear, this look is finished off nicely with black leather ballerina shoes. If you're obsessed with relaxed dressing when it comes to your personal style, you'll love this totally chic pairing of a black leather biker jacket and a Salvatore Ferragamo braided gancio bracelet. Play down the casualness of your getup with black cutout leather pumps. Wear a red blazer with a Salvatore Ferragamo braided gancio bracelet from farfetch.com for a casual coffee run. If you're a fan of comfort dressing when it comes to your personal style, you'll love this extra adorable pairing of a black floral bomber jacket and a Salvatore Ferragamo braided gancio bracelet. To add oomph to your outfit, complete with black suede heeled sandals.